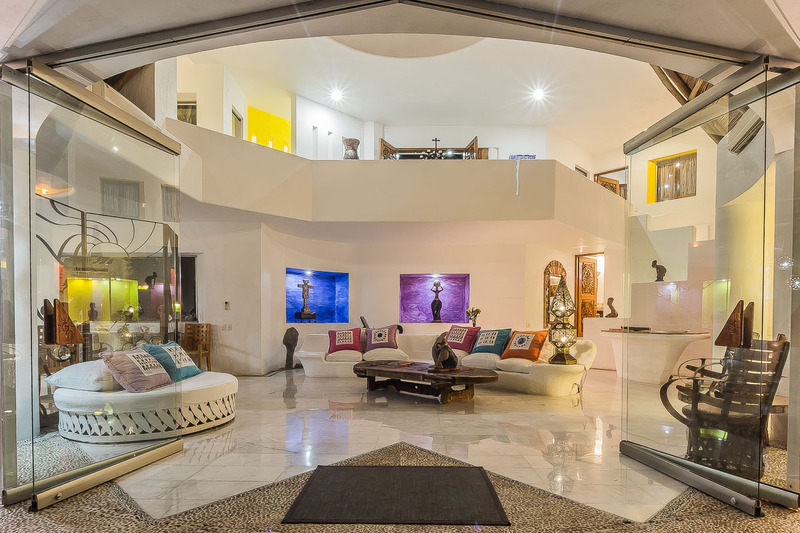 Le Corbusier’s “less is more” constitutes the guiding philosophy behind this open style of architecture that traces its roots to the genius of Luis Barragan, Mexico’s most famed contemporary architect. 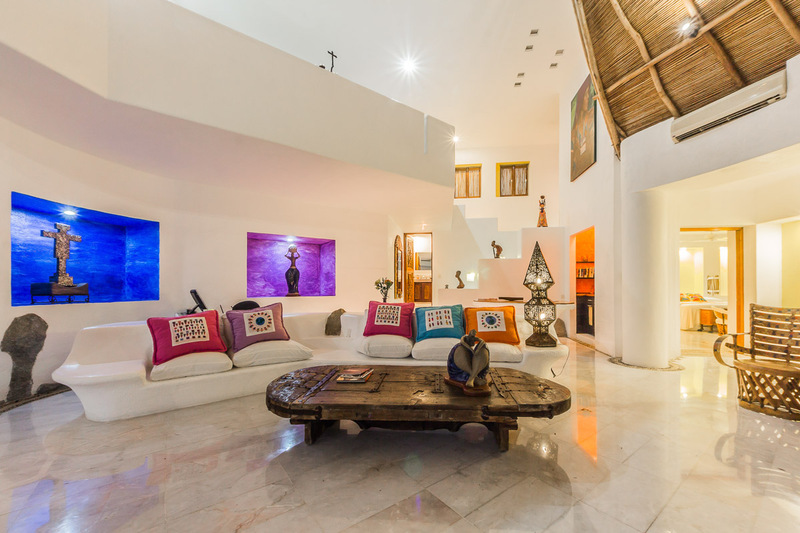 Barragan threw aside Mexico’s colonial architectural tradition to emphasize open spaces and a simplicity in design and furnishings. 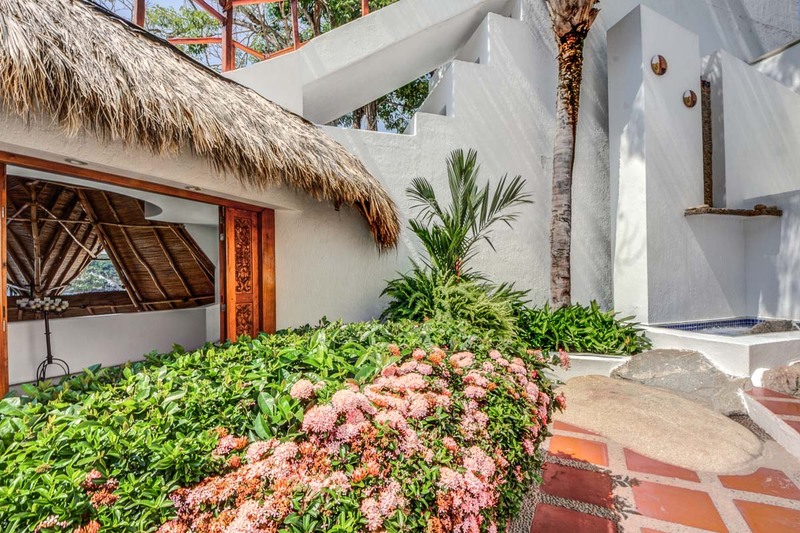 Effortlessly merging nature and lifestyle, a native cobblestone driveway leads to a stairway descending to rectangular thirty-six foot wide native stone and tile entry, shaded by four existing coconut trees, each from thirty to fifty years old. 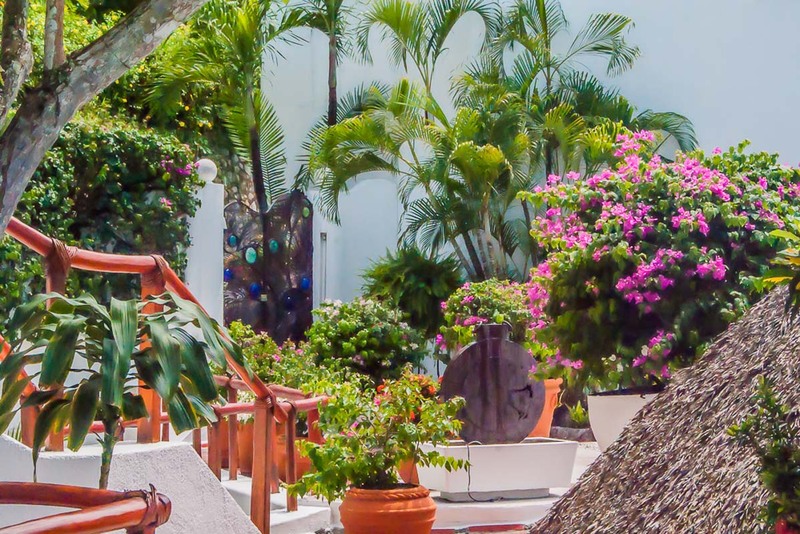 Cool waters from a blue-tiled fountain cascade before a white-washed wall, highlighting the entry and creating a serene and tranquil ambiance. 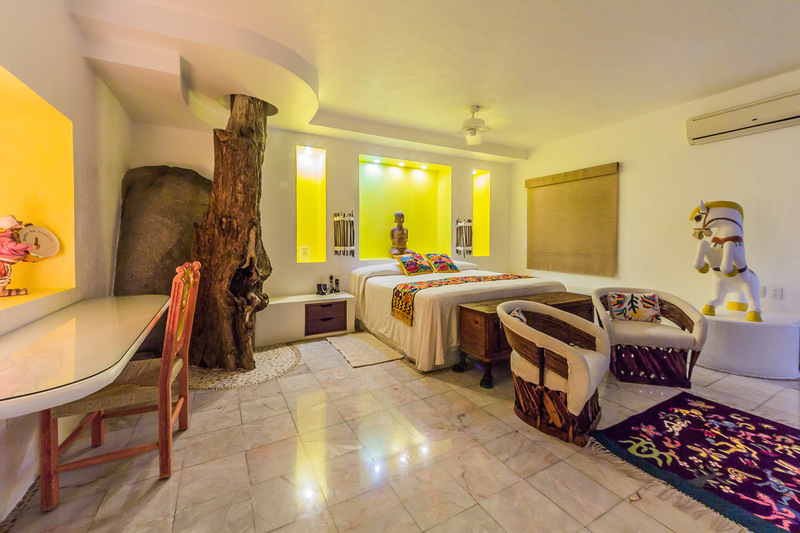 Inside Casa San Sebastian two half-century old hiquera (fig) trees form an integral partnership with this split-level residence, their gnarled trunks jutting upward through white marble floors and specifically-wrought ten-foot ceilings. 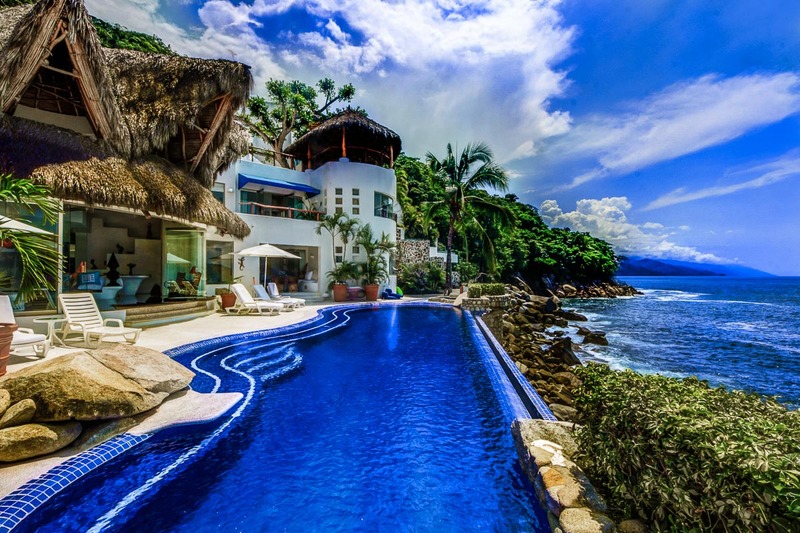 The hiquera’s massive umbrella-like limbs structures dominate the angular palapa peak and stand guard over the Puerto Vallarta villa, combining simple shade from the tropical sun with a sense of centuries-old permanence. 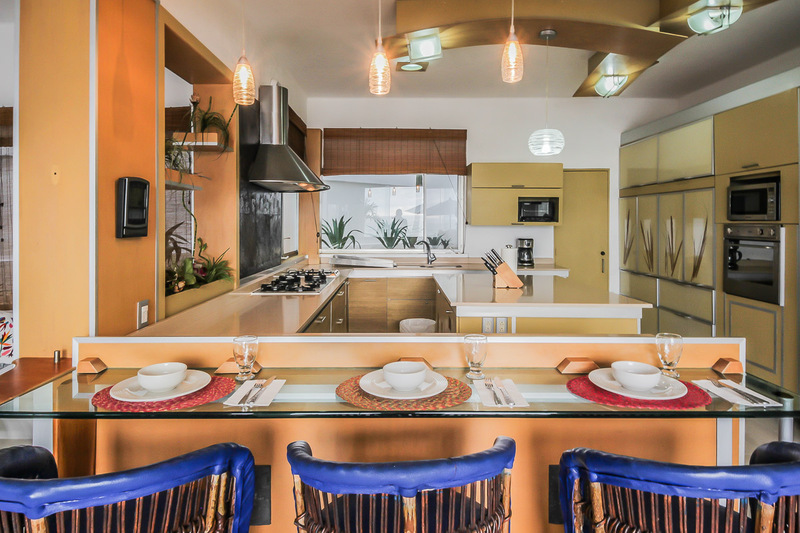 Vivid Mexican floral colors, pinks, blues and yellows, have been strategically used to highlight and create interior drama. 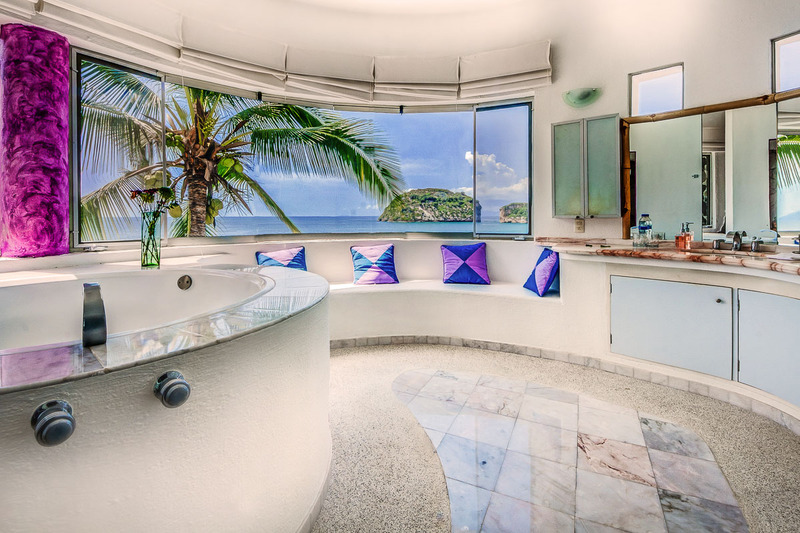 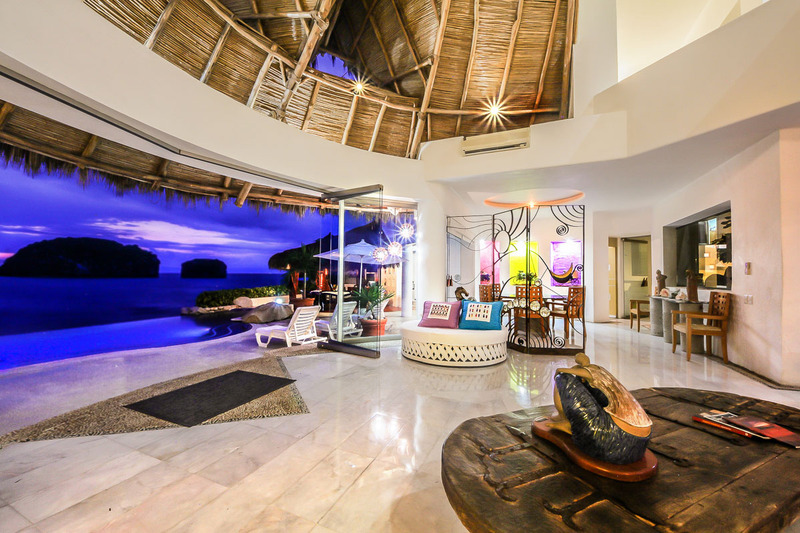 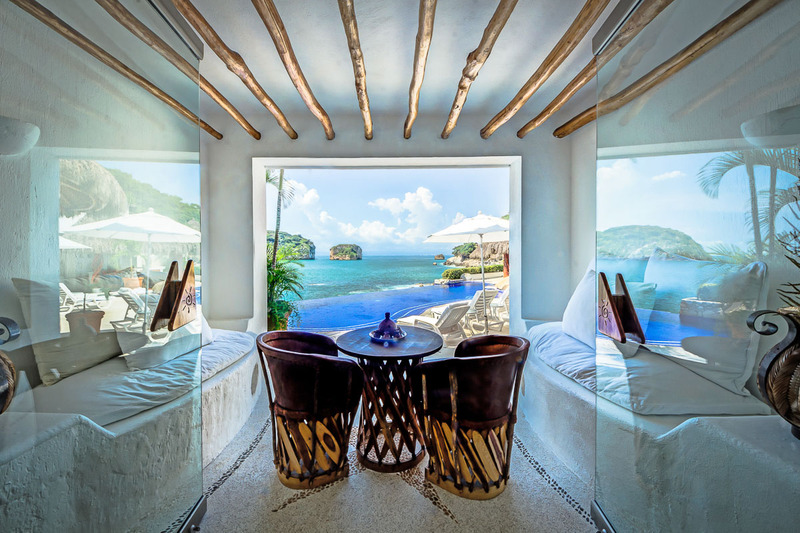 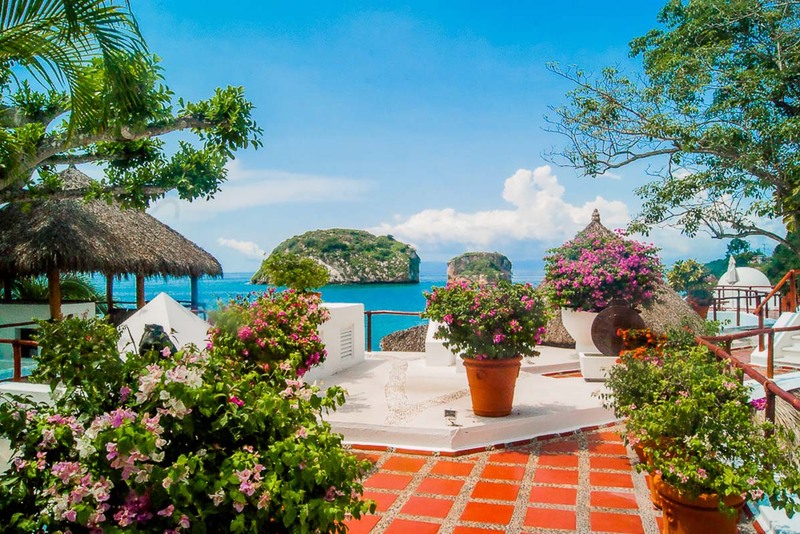 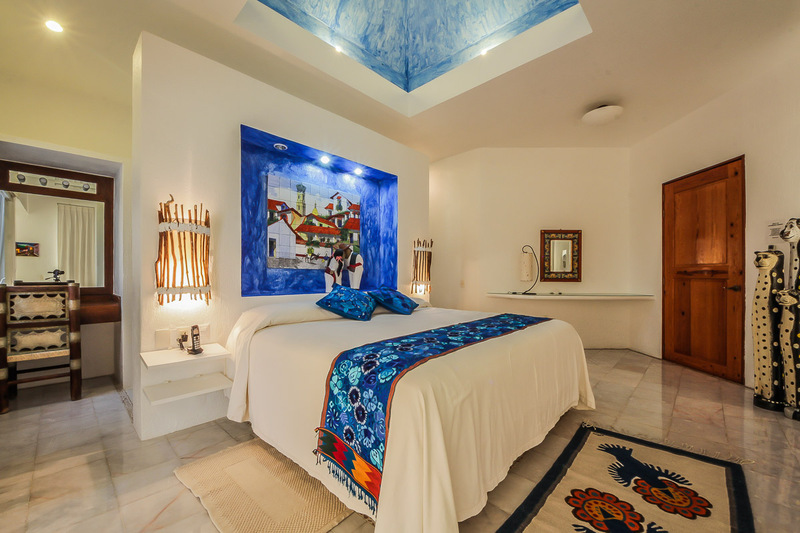 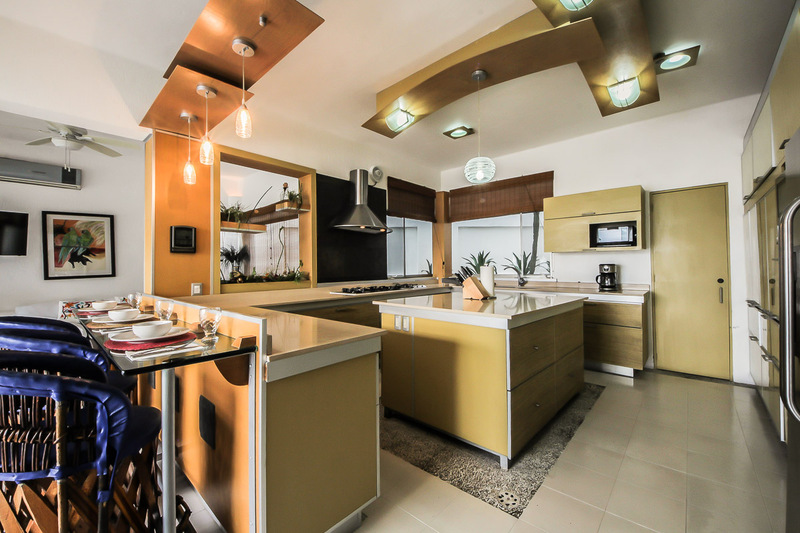 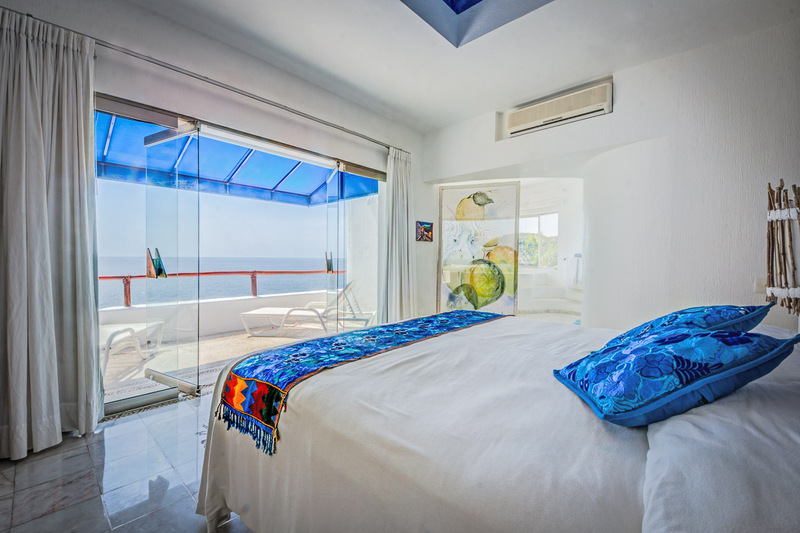 Such accent colors are favored in this new architectural style because of their affinity with the surrounding environment and because the colors offer a whimsical contrast with the white walls and blue-sky open-aired feel of the palapa. 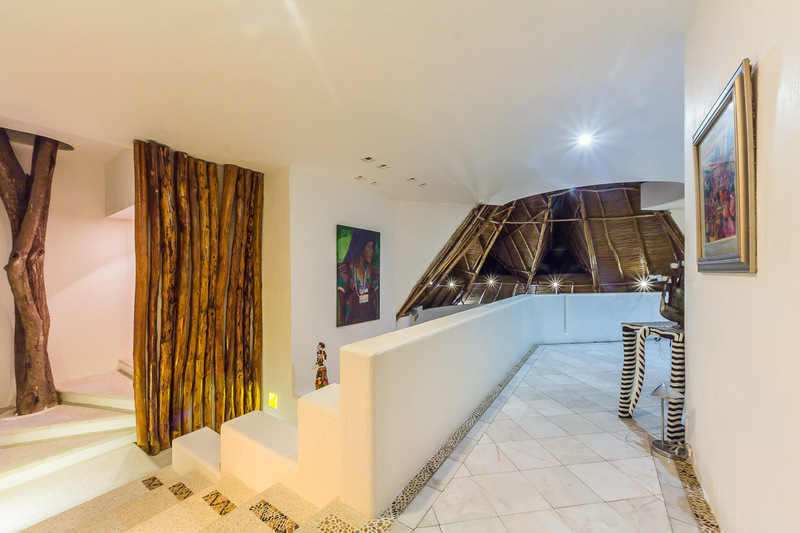 The architect Alberto Alvarez, a local award winning University of Guadalajara graduate, adopted the Pacific Coast style with grace and ease, and added his own particular creative touch resulting in a dramatic and spectacular residence. 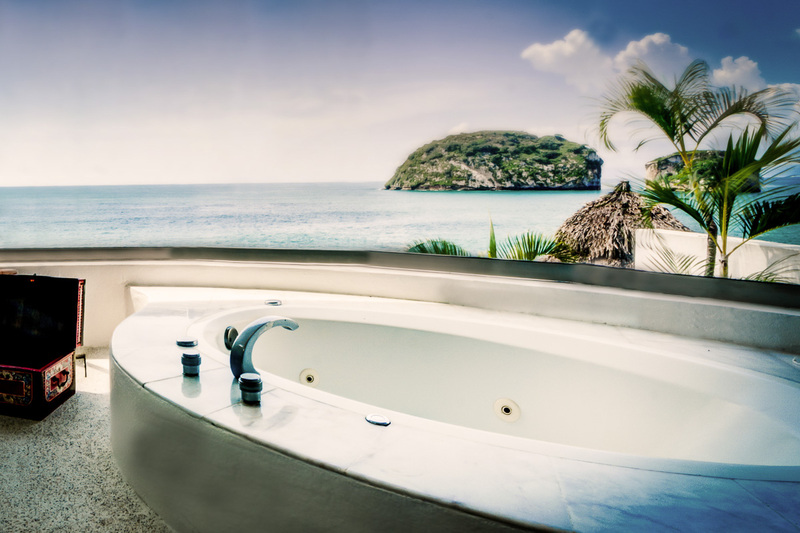 Comfort and luxury were always on our minds. 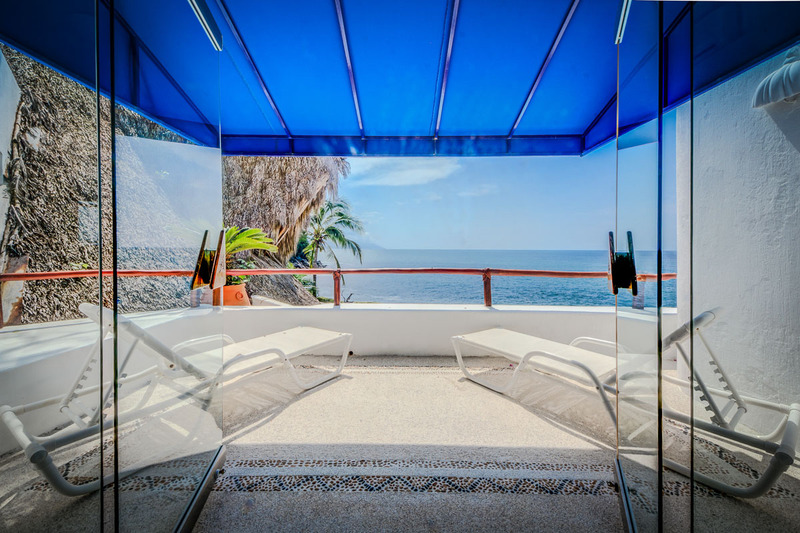 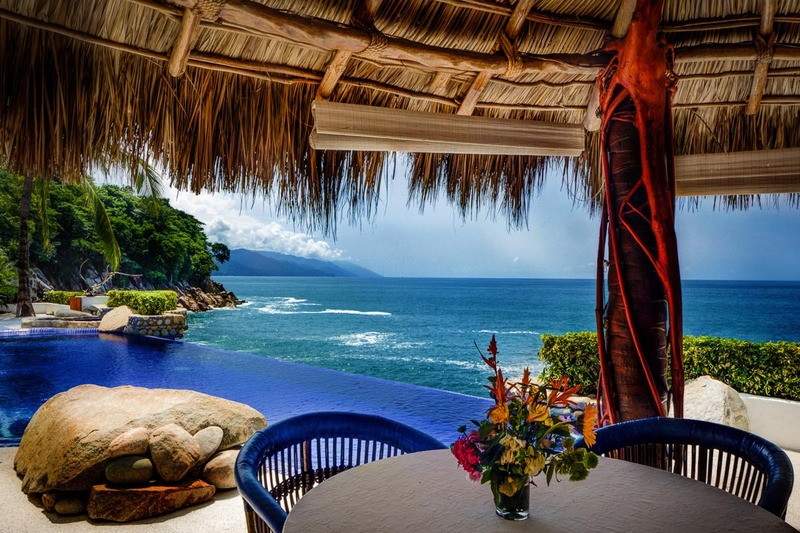 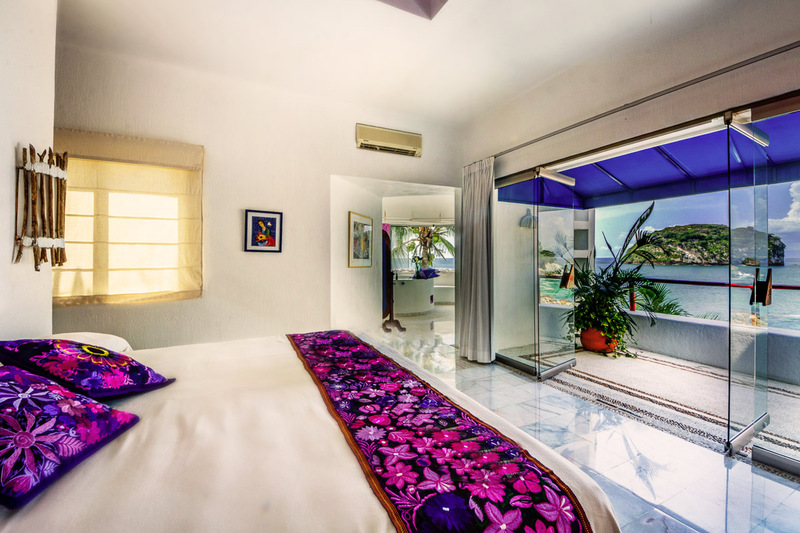 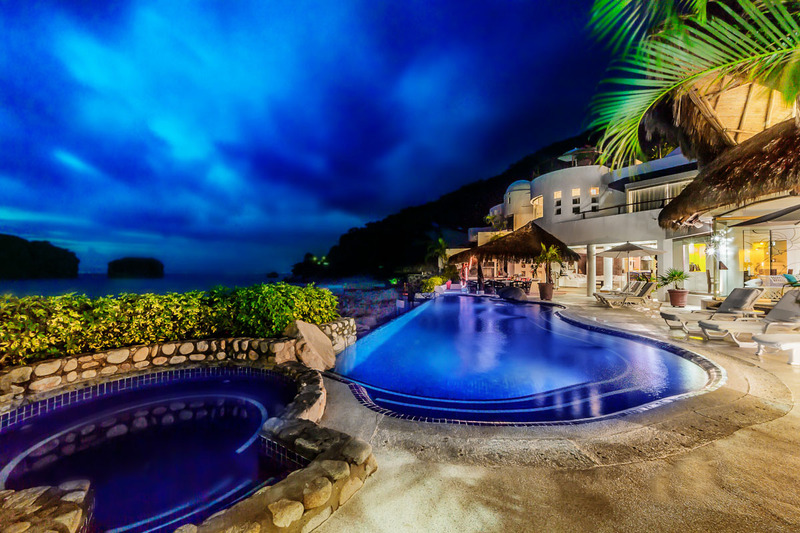 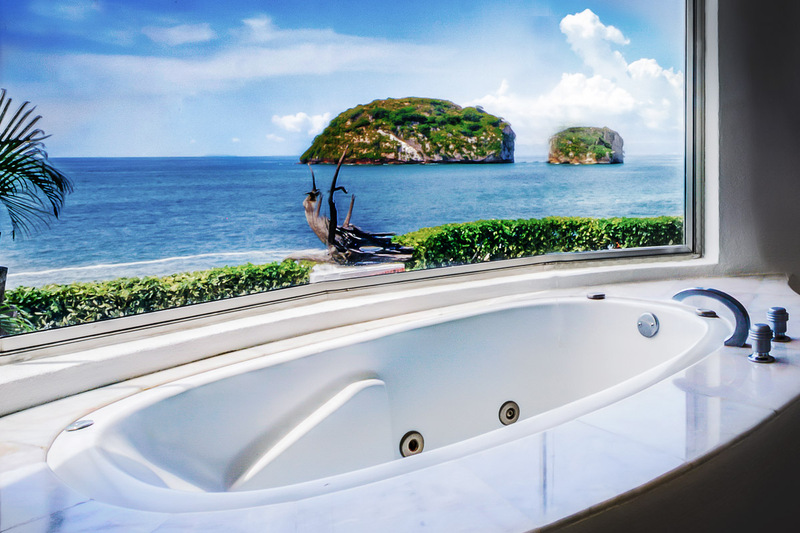 The Puerto Vallarta villa provides a happy, relaxed, leisurely setting, a place to recharge, to revitalize. 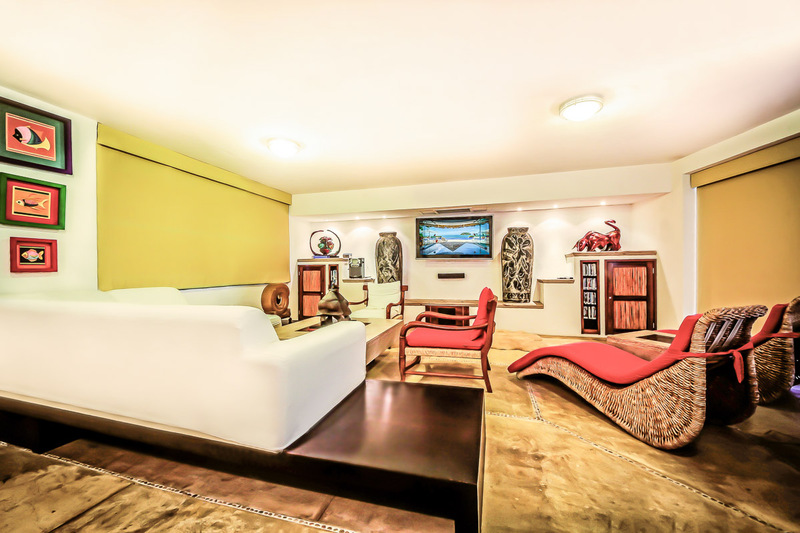 Longtime local interior designer-sculptor Jorge Rubio was selected to combine his talents with those of Alvarez. 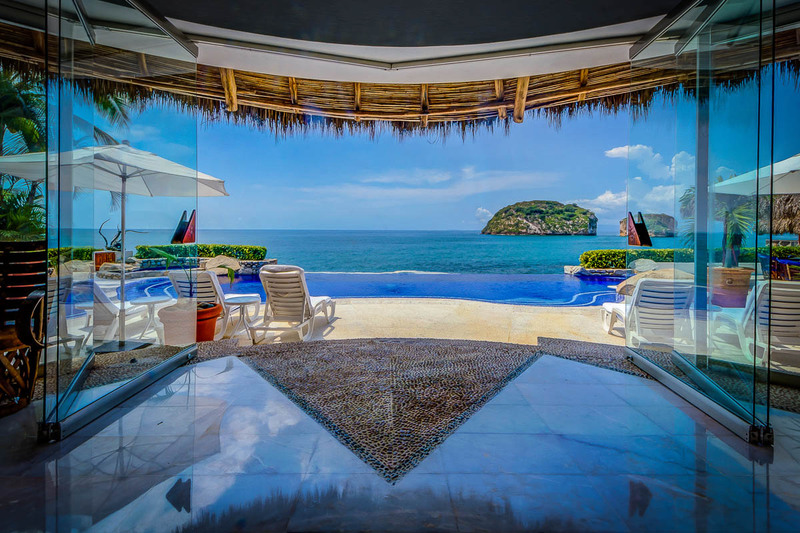 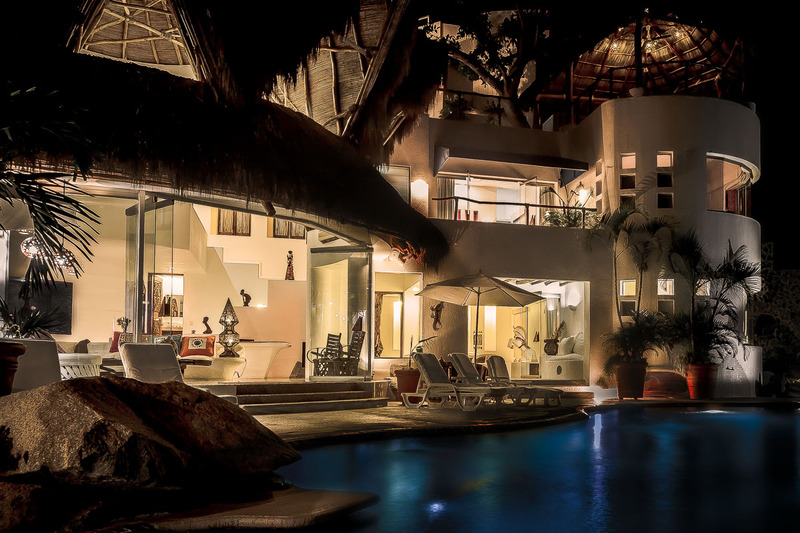 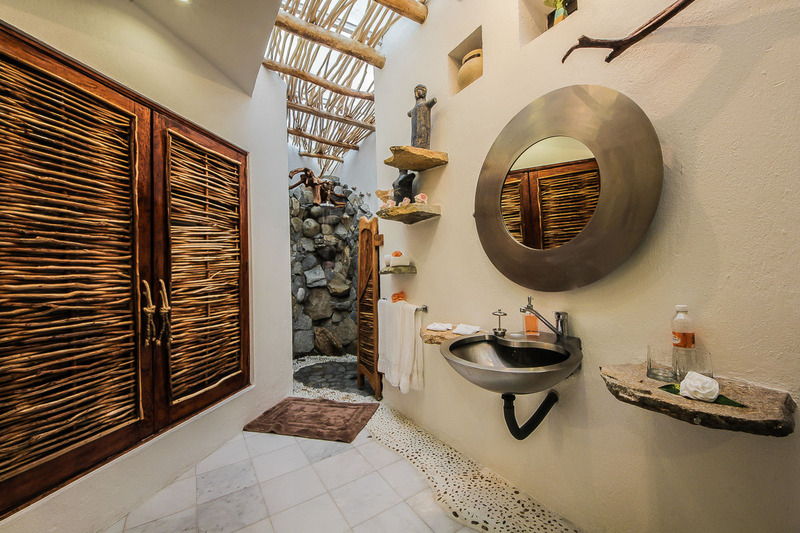 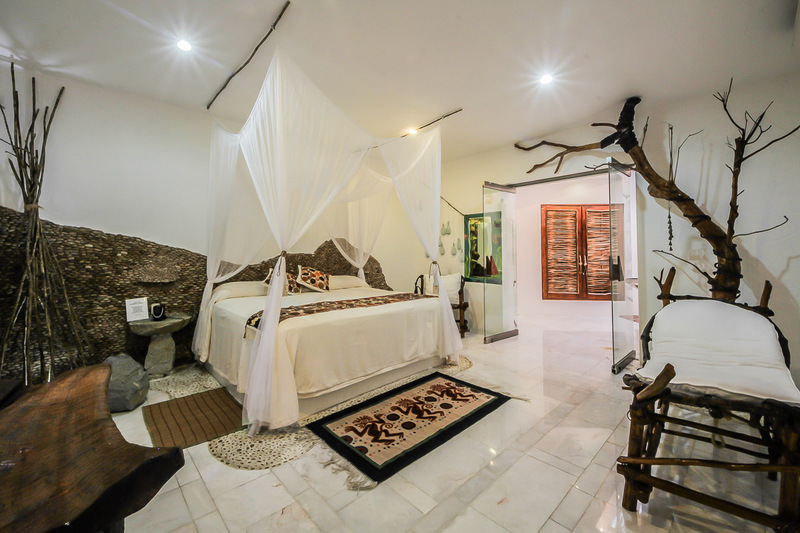 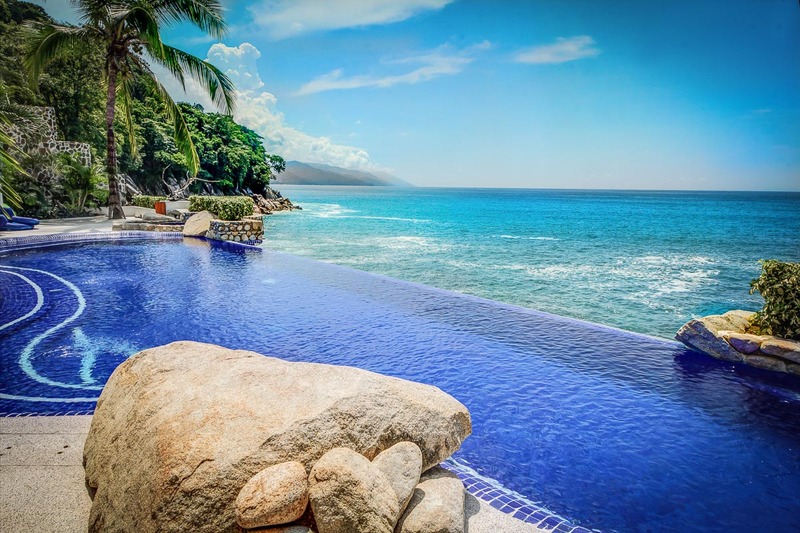 Rubio contributed an openness to the Puerto Vallarta villa in keeping with the “new palapa” style and completed the striking interior touches as the inclusion of naturally occurring boulders and trees in the structure. 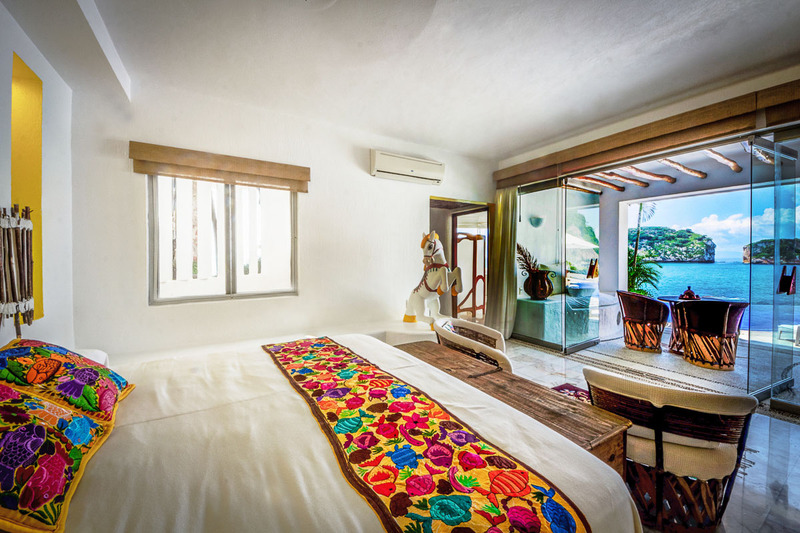 The interior furnishings of the home are a blend of Mexican traditional and modern, again in keeping with the Mexican Pacific Coast style. 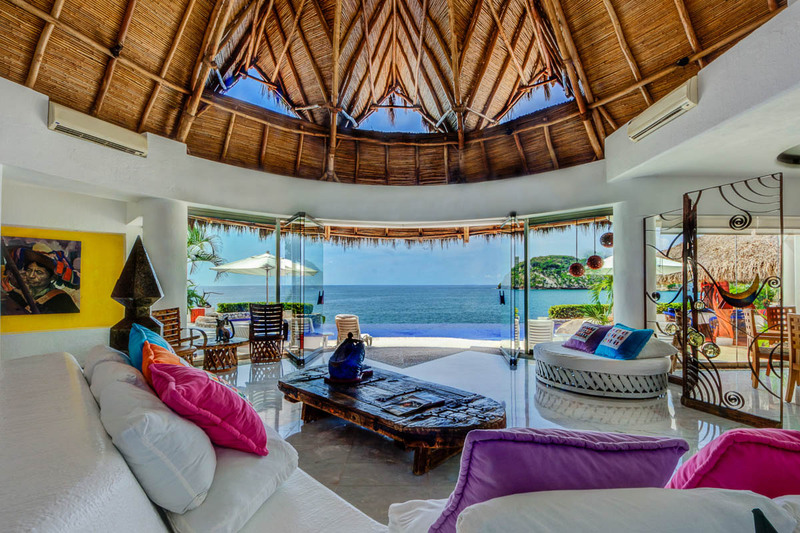 The award-winning Marta Figueroa, probably Mexico’s best known “equipales” (leather and wood furniture) designer, fashioned all of the interior furnishings and Mexican artesian Esperanza Acosta, who is internationally recognized for her woodwork, hand carved the Puerto Vallarta villa’s six massive doors.